Given the war on pollution, can MEP reform improve China's “mountains, water, forest, farmland & lakes”? In the 2014 Central Government Work Report, the word “reform” appeared 77 times. One reform expected in 2014 is reforming the Ministry of Environmental Protection (MEP) by merging it with various authorities in charge of the glaciers, rivers, lands, forests and oceans. 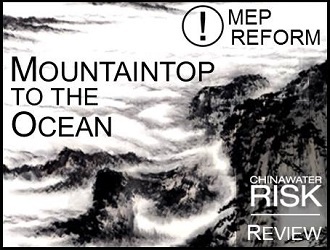 The much talked about “From the Mountaintop Down to the Ocean” reform is expected to give more power to the MEP to fight the “war” declared on pollution last week by Premier Li Keqiang (read about these efforts in “War on Pollution”). Given the current level of concerns over pollution & food safety, such reform is necessary to carry out the increasingly cohesive and comprehensive plans issued to address water scarcity, pollution and related food & energy security issues. The questions are therefore how and when? The MEP has been long regarded as too weak to punish polluters. This is largely due to dispersed authority and overlapping responsibilities in monitoring the environment. The MEP is a relatively new ministry formed in 2008 when it was “upgraded” to a Ministry from the State Environment Protection Administration (SEPA). Unfortunately, other existing ministries & administrations had been already looking after various parts of the environment. Under the current structure, the administrative authorities of environmental issues are dispersed among different ministries and administrations. Administrative departments usually have to spend great efforts in coordination before finally reaching an agreement to solve real problems. MEP will draft and monitor the implementation of the pollution prevention plan. Such distribution of responsibilities also exists in the management of surface water as well as the ocean, making it difficult to monitor individual ecosystem as a whole. It also makes the execution of punishments towards pollutions relatively slow and ineffective. In addition, there are overlaps in the monitoring functions of these ministries and administrations. Currently, monitoring water quality is one of responsibilities of the MWR as per the Management Measures of Water Functional Areas. However, the MEP is also in charge of monitoring functions such as managing wastewater treatment and supervising Environmental Impact Assessment (EIA). For the water pollutants, the MWR monitors the total amount and set the “redline” while the MEP monitors and manages its own indicators. These “same-but-different” functions also result in inconsistent and inefficient data collection. It would make more sense to merge the monitoring functions of the MWR & the MEP to establish a unified national system covering both groundwater and surface water. 11 November 2013: Regulation on the Prevention and Control of Pollution from Large-scale Breeding of Livestock and Poultry is the 1st national level environmental protection legal standard targeting pollutions from animal husbandry. It has entered into force on 1 January 2014 and will need the MEP and the MOA to work together. 30 December 2013: The MOA announced that around 3.33 million hectares of farmland is too polluted to grow crops. 13 January 2014: The SFA stated that around 9% or an area of 34,000 sq. km. of wetlands has disappeared over the last decade. “Soil Environmental Protection Law” is under drafting and requires cooperation among several ministries including the MOA and the MEP to control pollutions from agriculture & industry, especially heavy metals from the industrial wastewater. With more effective and cohesive policies to come, deeper and more efficient collaboration among the ministries are also needed to execute them. Obviously, merging those environment-related responsibilities currently in the MOA, the MLR, and the MWR into the MEP will be an easy option. It could further strengthen the MEP’s administrative stability, decision-making power as well as access to resource. Nevertheless, increased collaboration and “unsiloed” approach to address issues at the water-energy-food nexus is a trend we expect to see continue in 2014 (see our 5 Trends for 2014 here). A “Super MEP” is necessary in to make this happen. Reform looks set to happen: the questions are how & when? There is no doubt that the dispersion of authority has not only weakened the MEP’s effectiveness in execution. It has also resulted in inefficient use of public resources. As President Xi said in his government report on 15 November 2013, “Mountains, water, forest, farmland and lakes are all parts of a common living circle… the administration of their use and ecological rehabilitation must be in accordance with the law of nature”. 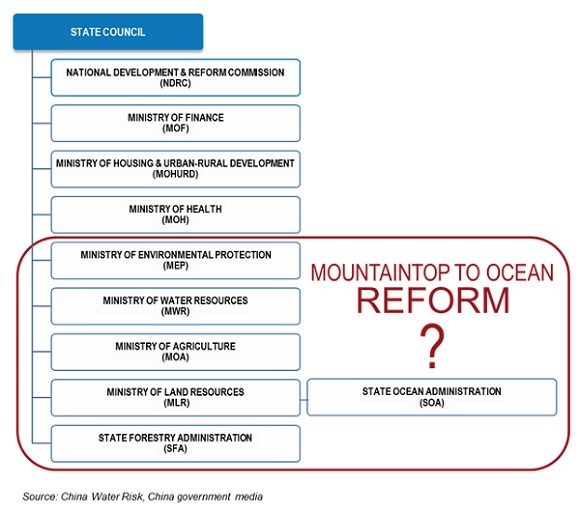 These voices from central government leaders signal the government’s will to restructure its ministries to better manage its “mountains, water, forest, farmland and lakes” for a “beautiful China”. At a minimum we will likely see some of the responsibilities held by the MWR, MLR, MOA, SFA and SOA to be merged into the MEP; in addition, it is rumored that MLR will even be dissolved and its responsibilities will be merged into relevant ministries. No matter whether we will end up with a Super MEP, or just a better collaboration among the different ministries, the reform of the MEP is inevitable. Indeed, SEI#1 expected to be a RMB4.5 trillion (US$750 billion) industry and without a big stick wielded by a “Super MEP”, it is difficult to see this can be achieved. It will not be an easy task to balance the water, economy, food and energy whilst maintaining stability, amidst a backdrop of climate change – a Super MEP would give a government a better fighting chance. Fundamental Issues: Industrial Wastewater Professor Ma Zhong, dean of the School of Environment of Renmin University gives his in-depth views on the industrial wastewater standards & pricing. Is it cheaper to pollute than to treat?